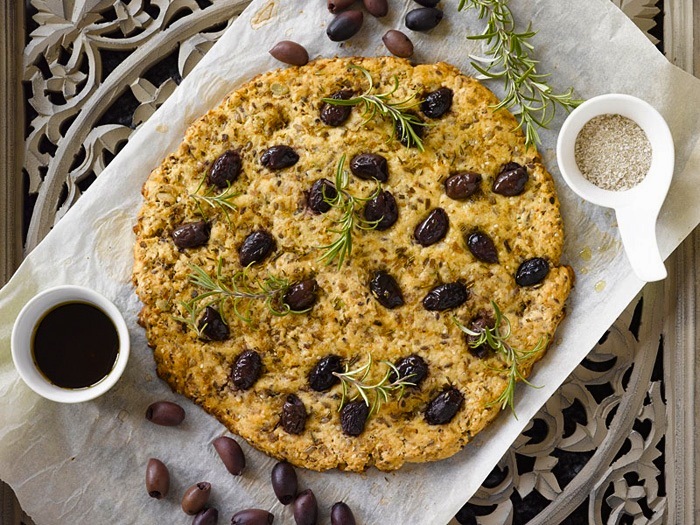 Everybody loves Focaccia – the bread, the oil, the olives and the spices! It is super easy to use the Sukrin Sunflower/Pumpkin Seed Bread Mix to make a delicious gluten free low-carb focaccia bread – and it makes a great side or snack. Adding a little olive oil to the bread mix makes for an even richer tasting low carb bread. Quick and easy to make, it looks so impressive!! Great served on the side of your low-carb dish, as part of an antipasti platter, or take to work to eat with your soup. Try adding different low-carb toppings: halved cherry tomatoes and basil, cooked bacon and blue cheese, mushroom and garlic… Sukrin low carb bread mix is great for recipes like this as it takes flavors really well and is really easy to shape either with wet hands or a spoon. How about mini focaccia? Make them whatever size you like and bake until golden.